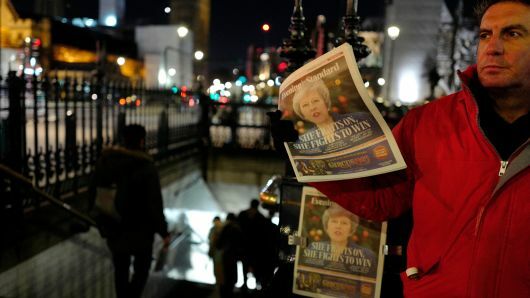 Following the resounding defeat of U.K. Prime Minister Theresa May’s Brexit deal in the U.K. Parliament last night, the global media are giving their reactions to the vote – and they’re not holding back. May’s deal was roundly rejected by British members of Parliament (MP) with 432 MPs voting against it and 202 approving it, marking the worst political defeats in parliamentary history. The leader of the opposition Labour party, Jeremy Corbyn, tabled a motion of no-confidence in May’s government following the vote on the contentious “Withdrawal Agreement”, essentially it’s blueprint for leaving the European Union. The U.K. government now has three working days to map out a new plan of action. The vote, and the 230-vote loss, was covered in extensive detail by both U.K. and international media. For the British media, Tuesday’s vote that gave Parliament a say on May’s Brexit agreement with the EU was the climax of months of reporting on the intricacies of withdrawal negotiations with the EU and the warring ‘Remainer’ and ‘Brexiteer’ factions in Britiish politics. The Telegraph, a long-time ally of the Conservative party and pro-Brexit newspaper, branded the defeat ‘A complete humiliation’ on its front page Wednesday and showed a glum-looking Theresa May on the front bench of Parliament. The paper noted that despite Labour leader Jeremy Corbyn tabling a vote of no-confidence in Theresa May, she still has the support of the majority of her party. Corbyn would need two-thirds of MPs to support his motion for a general election to take place. Prime Minister May is not expected to go immediately to Brussels to try to renegotiate the deal and certainly Europe has showed no intentions of being willing to amend what’s on offer. The most contentious issue for British MPs is what’s known as the Irish “backstop” — essentially what status Northern Ireland and its border with Ireland would have in the event that the U.K. and EU could not strike a trade deal in the transition period following Brexit. The Irish Times said May was “all at sea” as the “tide turns against her backstop deal” and that the scale of May’s defeat had surprised Dublin. Ireland is the EU country that could be most impacted by Brexit given the large amount of trade and cultural links between the U.K. and Ireland. The New York Times led with May’s defeat in parliament and looked ahead to the confidence vote while the Washington Post said the defeat put the U.K.’s withdrawal from the EU “in doubt.” The Wall Street Journal echoed that sentiment. In the Chinese press, the South China Morning Post noted that the Brexit deal was “basically dead” and that “Brexit (is) in chaos.” Meanwhile in Russia, newspaper Novaya Gazeta carried a report on the Brexit vote but others, like business daily Vedomosti, avoided the subject. Russian broadsheet Izvestia which said that the vote could lead to the postponement of Brexit or an “outright political crisis in Britain” − most of the global press think that has already happened.